Ashington FC manager Steve Harmison slammed his misfiring outfit after their 1-1 draw against Seaham Red Star on Saturday. The Colliers did extend their unbeaten run to six games, but the boss was far from happy. “There are too many of our lads not doing it and it’s not good enough,” he said. “I think we have to look at that as a collective unit because I had seven first team players out injured today – but I’m not making that an excuse. “We had good enough players on that pitch to win the game but we didn’t perform. “We made silly mistakes. It’s hard because we had to make an early change in the back four which disrupts us in wide areas but even then we were making mistakes in defence. “If we had been playing well all season I would have said this was an off day, but it wasn’t. 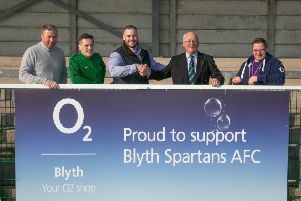 He continued: “We had more supporters here today than Seaham, along with our committee, and I feel sorry for them more than anything else having travelled from Wansbeck to watch that performance because it was nowhere near good enough to be associated with Ashington FC. “It’s a case of having a look and making sure that what we have got, (the playing staff) are good enough to take us forward because at this moment in time, they are not showing that, and that has to be the case. “It’s not a rallying cry either to say there are going to be wholesale changes. “We are still unbeaten with the draw today but a point is not good enough for us and if I’m really brutally honest, did we deserve it? “Yes we hit the bar late on, but Seaham had a few good chances as well. “I am getting frustrated saying the same things and it’s not fair on the club; the supporters and it’s actually not fair on the players themselves. “We have got very good players in that dressing room but for some reason they are not playing. “It’s hard because Andrew Johnson is having to play in centre midfield and his best position is out left, but unfortunately we haven’t got any other options. “Josh Gray had to go off today after 20 minutes which affected our whole plan. “He’s got a double hernia and is going to be out for a while now so that’s eight players who are not available.